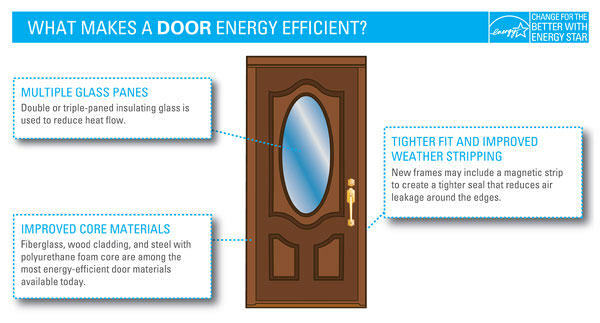 EnergyStar.gov published these easy-to-understand graphics to help consumers to understand what features of a window and door create energy savings. We thought you should see them. 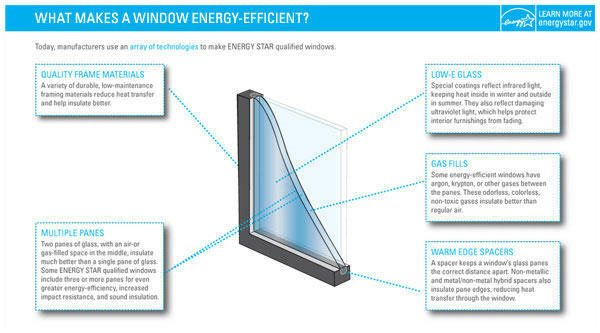 Taken from the ENERGYSTAR.GOV website. Fargo, N.D. – A total of 14 ABC Seamless companies have been recognized in Qualified Remodeler’s “Top 500” list for 2008. The annual listing is published in the August issue of the national trade publication, Qualified Remodeler Magazine. Companies that make this exclusive list are recognized for six criteria of success: Annual sales volume for 2007, total number of years in business, association service, certified personnel, community service and industry awards. “Our longevity and consistent ranking in the Top 500 shows we take great pride in the installation of our seamless siding and seamless gutters on every home we do.” ABC Seamless president Jerry Beyers said. In a separate ranking specifically for companies that franchise, the ABC Seamless franchise system was ranked seventh in The Top 500 National Remodeling Firms category. ABC Seamless Siding, “The World’s Largest Seamless Siding Company”, manufactures seamless steel siding, seamless steel log home siding and seamless steel gutters on the job site. The company also installs steel soffit and seamless steel fascia and metal roofing on residential and commercial buildings. The National Franchise Headquarters is based in Fargo, N.D. ABC Seamless Steel Siding has 111 franchises in 30 states. Visit our online showroom at http://www.abcseamless.com. Below are the ABC Seamless franchises that ranked in Qualified Remodeler’s “Top 500”. We’ve discovered that homeowners choose vinyl, fiber cement board, boxed steel and aluminum siding products because they don’t know the problems that seams cause on a home. This short video explains the seamless advantage and will show you why NOT to choose these other products if your goal is lifetime value and maintenance-free beauty for your home. The major factor that sets us apart is that your entire home will be sided without any ugly seams. That’s why we’re SEAMLESS. Other siding must be overlapped every 12 feet, creating a pattern of at least 130 ugly seams on an average size house. But each ABC piece of ABC Seamless steel is formed and cut to the exact length of your home, eliminating the seams. 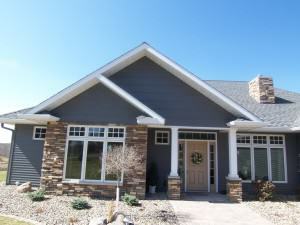 And just look at the difference between a home sided with vinyl, and a home with ABC Seamless Steel Siding. When they say seamless they’re—“Without any Quacks!”—That’s what they mean. A house with a lot of ugly seams has a tendency to allow more dirt, bugs, and moisture behind the siding; which can make the home look dirty and unattractive. ABC Seamless Steel Siding can minimize these problems. We had been thinking about getting siding, steel siding, permanent siding, and I guess when we looked around—the vinyl siding always bulges, the other siding has all the cracks and the seams. No matter what you do, you’ll always see them. Ugly seams are necessary for other forms of siding because they need to allow for the shrinking and expanding that is caused by varying temperatures. The UGLY result? It will slowly separate and eventually bulge, crack, or blow off—not a pleasant sight for yourself or your neighbors. The answer to these concerns is as simple as A-B-C Seamless. We thought we were getting a no-maintenance siding before, and now we hope we have it. That and the warranty were what really impressed us. We got so badly stung by the preceding siding that we came in with sever criteria… Warranty was number 1. With ABC Seamless Siding your worries are over. You can create a completely new look for your home that will last forever and impress your friends and neighbors. 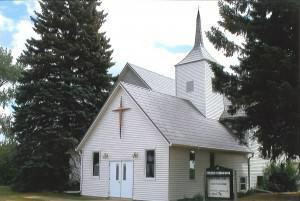 When Our Saviour’s Lutheran Church in Dazey, North Dakota wanted to revitalize the building for their 125th Anniversary in September of 2009, the Board of Trustees requested bids from 3 companies. “The roof was in great need of repair. A large evergreen had fallen on it during a wind storm back in 2007,” said Philip Quick, Our Saviour’s Treasurer. Dazey, North Dakota was established in 1883 by a group of hard-working Scandinavian settlers, mostly from Norway who farmed grains in the rich, fertile soil of Barnes County. Today, the community is home to around 100 poeple, primarily farmers and their families raising grains, beans and corn. 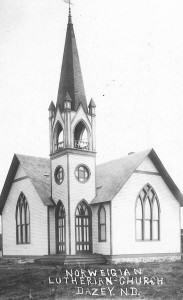 Our Saviour’s congregation first organized in 1884 and the church that stands today was built in 1902. In the 107 years since it was built, the church’s wood siding had been repainted numerous times. The narthex addition at the entrance had 2 windows that needed replacement as well. ABC Seamless has been trusted to protect houses of worship across the country for more than 35 years. Nationwide we have installed seamless steel siding and gutters, and replaced windows for more than 600 churches in 35 States. When the Board of Trustees at Our Saviour’s Lutheran Church asked us to present our services, we sent Steve Kelley to represent our products, and Jim Burgard to represent the installation process. “The Dazey project was bigger than just a roofing project, the Church was looking at fixing the building to last a lifetime,” said Steve Kelley, the ABC Seamless sales consultant for this project. ABC Seamless addressed the Church’s primary problem by offering a high-performance steel shingle roof that provides protection from hail, fire, wind, snow and rain. Our steel roof is protected by a lifetime, non-prorated limited warranty with hail and fade protection. The color that the members chose also meets EnergyStar performance standards, ensuring that the building will be heated and cooled with maximum efficiency. ABC Seamless proposed an all-steel exterior for the church for protection and longevity, bringing maintenance-free seamless steel siding and gutters into the discussion. 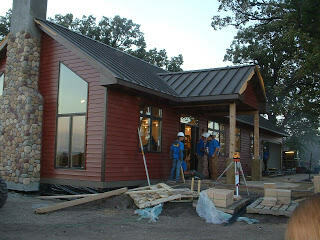 Their EnergyStar siding underlayment insulates the Church from icy winter winds that chill interior walls. Of the three companies that Philip and the remodeling committee started working with, ABC Seamless and another company put in comparable bids. One of the companies never replied to the bid request. Overall, ABC Seamless was best prepared to take care of all the project specifications for the Church in Dazey and was granted the work. “It was important that the remodeling was completed before our 125th Anniversary celeration. The installers really put in some long days,” said Philip. The Church project was completed in plenty of time for the celebration. “Everyone is very happy with the final look.” It wasn’t long before word spread throughout the area and members of other Churches came to see the work. Contact us today for a no-obligation quote for your home or place of worship. If you’re ever near Dazey, we welcome you to visit Our Saviour’s Lutheran Church. Find your nearest ABC Seamless dealer and arrange for a free estimate. Did you know that there are over 27 different kinds of vinyl siding on the market today? They all claim to be the best. But you know what? Where do you keep your barbecue grill? It only takes temperatures reaching 160 degrees for vinyl to melt. The sun can get that hot reflecting off your neighbors’ windows.And over time, vinyl siding fades drastically when exposed to sunlight—which makes matching the color nearly impossible. 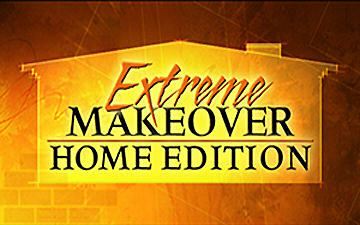 Dirk and Susan DeVries of Hayward, MN was awarded an entire home rennovation thanks to ABC Television’s Extreme Makeover: Home Edition. Among the top area contractors chosen to participate in the demolition and re-construction of this rural Minnesotan home was Paul Field’s Home Solutions Midwest , our ABC Seamless Franchisee out of Albert Lea, Minnesota. Paul’s crews installed Double 5” Cinnamon Siding with Rustic Brown Soffit & Fascia. They were complimented on their efficiency and the quality and appearance of their product by many of the contractors on-site. We’re certainly happy to hear that the homeowner’s are excited to be back in their home, and would like to show you what makes seamless steel siding better than all other options. Saving through Impact Resistant Roofing! Saving through Impact Resistant Rofing! Did you know that by replacing your roof with a qualified impact resistant roofing product, you might qualify for a discount on your State Farm Homeowners insurance? Impact resistant roofing products are more resistant to hail, flying depris and high winds than non-impact resistant roofing products. Some are warranted by the manufacturer against wind up to 130 mph. If you sell your home, the new owner may be eligible for a homeowners insurance discount, which can be a good selling point. For a complete list of qualifying products, go to: Roofing: Premium Credits Product List. Contact your State Farm agent for more information. 1 Reduction of your homeowners insurance premium depends on your state of residence. Some restrictions may apply. Follow the link above for a list of qualifying states. 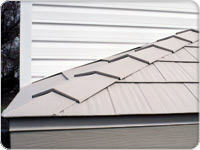 2 For qualifying metal roofs, a cosmetic damage exclusion is required to receive the discount. If you’re in the real estate market and have a building to sell, making a good first impression is key; taking care of the outside of a building can mean all the difference between a sale and a flop. New siding can be part of making that first impression. Of the many siding choices on the siding market, steel is not always the first thing that comes to mind when you think of durable, affordable, low-maintenance siding. However, this is one of the top long-standing choices for larger buildings, namely shops and industrial buildings, for a good reason. Steel isn’t just for industrial-sized structures, and can be made in any number of colors and textures. Seamless steel siding eliminates the unsightly seams that can allow moisture through, significantly diminishing the possibility of rot. The general public is only just beginning to realize all the wonderful benefits steel over the highly publicized and extremely popular vinyl siding. The durability of steel far outshines that of vinyl if it’s installed properly. While exposed edges or damage to the paint can leave it vulnerable to rust, proper maintenance can prevent that drawback. Where vinyl is prone to damage from high winds and hail, steel can withstand all but the most severe of these elements. 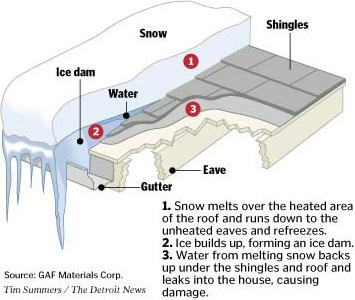 Properly-installed steel siding is almost impossible to pry loose in the wind, no matter if it is gale-force, though larger hailstones may be able to dent the siding or scratch the paint. If you’re environmentally-conscious, ask your contractor if they use recycled steel for their siding. Much of what is sold for siding today is recycled, thus promoting waste reduction as well as purchasing something that can be recycled whenever it is no longer of any use. Steel isn’t the cheapest option on the market – in fact, it ranks among the most expensive – but it is well worth the money you put into it. It’s low maintenance, and cleaning is as simple as spraying with water from a garden hose. Especially in areas known for inclement weather, steel will withstand whatever nature throws at it for long-lasting protection and beauty. For real estate owners looking to sell, the type of siding used on the building can be a high selling point.